Amiable Robbie Thompson of Sturgeon Bay can be a very dour Scot when it comes to the sea lamprey, scourge of sport fishing in Georgian Bay. 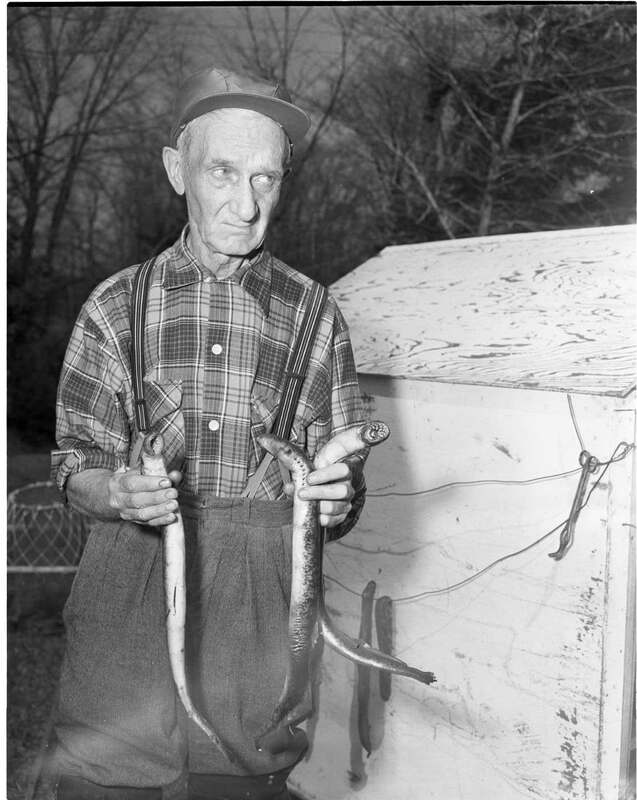 He’s seen here holding three of the eels he caught in the Department of Lands and Forests weir on the Sturgeon River. Hundreds of Lamprey Eels have been captured in this Lands & Forest weir on the Sturgeon River. They threaten the existence of sport fishing in Georgian Bay. 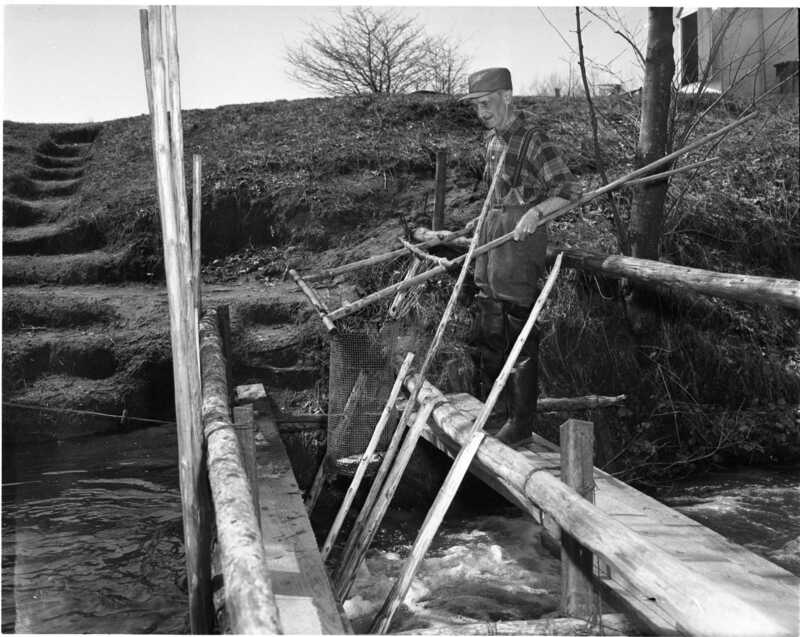 Robbie Thompson who tends the weir is seen inspecting his catch. An award of appreciation is presented to Midland CIBC bank manager R. G. Gillies by Capt. Ray Smith of the Salvation Army for 14 years service as treasurer of the Red Shield appeals in North Simcoe. The presentation was made at a Kiwanis Club meeting. League director, Rev. 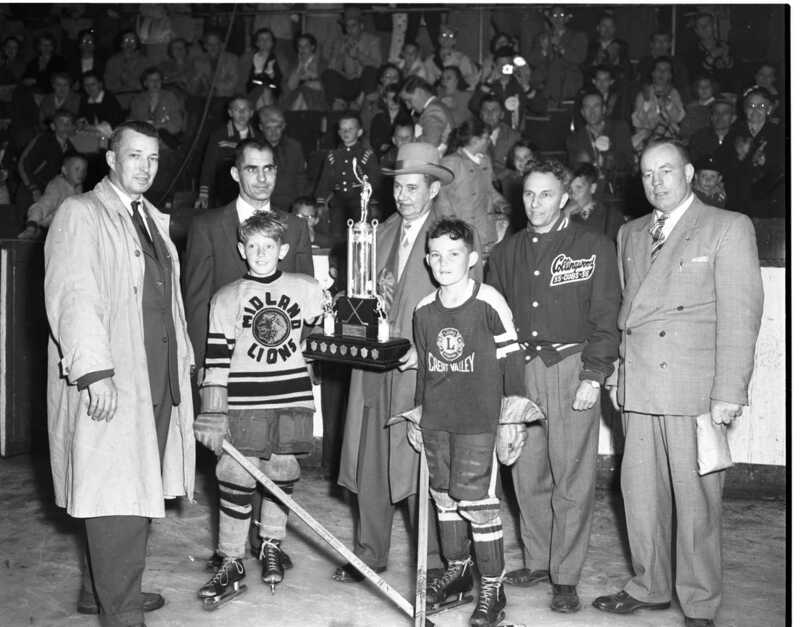 Len Self and team captain Chester Graham beam as they receive the LHL Jr. A Trophy. Captain Jim Stanfield of the losing team, “Babe” Schultz of Collingwood, Keith Carruther Port Hope Ontario LHL vice-president, Keith Kirby Collingwood recreational director and the manager of Toronto Twp. team are the others in the photo. These Midland lads had plenty to cheer about when they arrived home from Collingwood with the G. M. Graham Trophy and the junior “A” championship in the Ontario LHL playdowns for the second successive year. 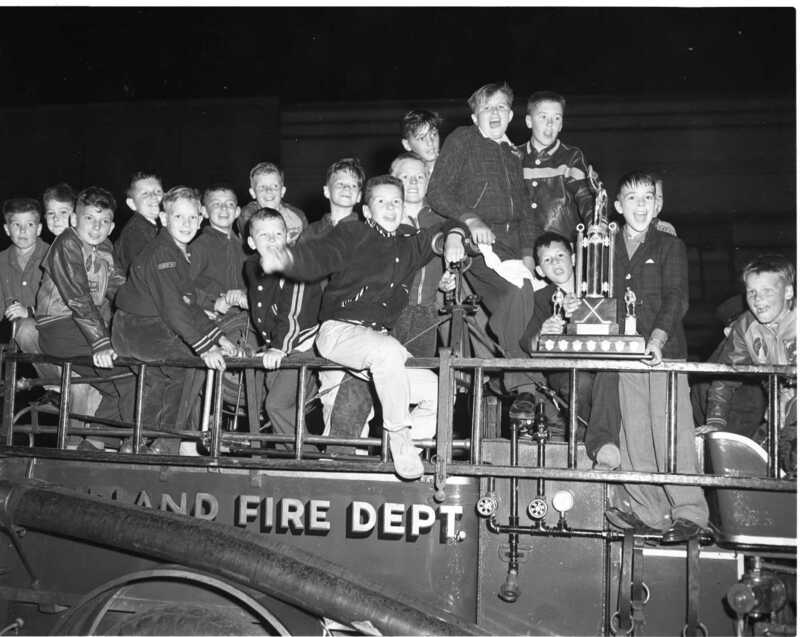 It’s hard to say which gave them the biggest thrill, winning the cup or the ride on the fire truck through Midland streets. Veteran linotype operator at Midland Printers Limited, Charles Goodfellow celebrated his 68th birthday April 30. 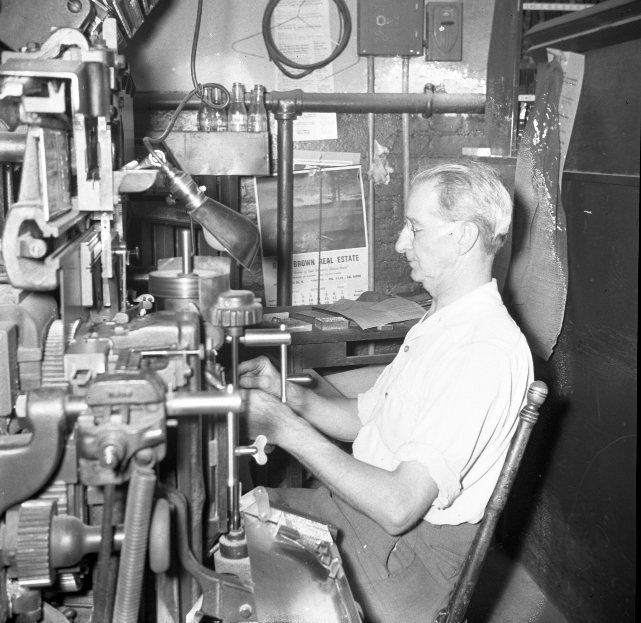 Mr. Goodfellow first started to work on the paper in the summer of 1898. In June of that year, his father, the late J. F. Goodfellow, and his Uncle Charlie bought the Free Press. A young man from Waverley and a Huron county girl who met by chance in far-off Brandon, Man., many years ago, marked their golden wedding anniversary in Midland last Wednesday. 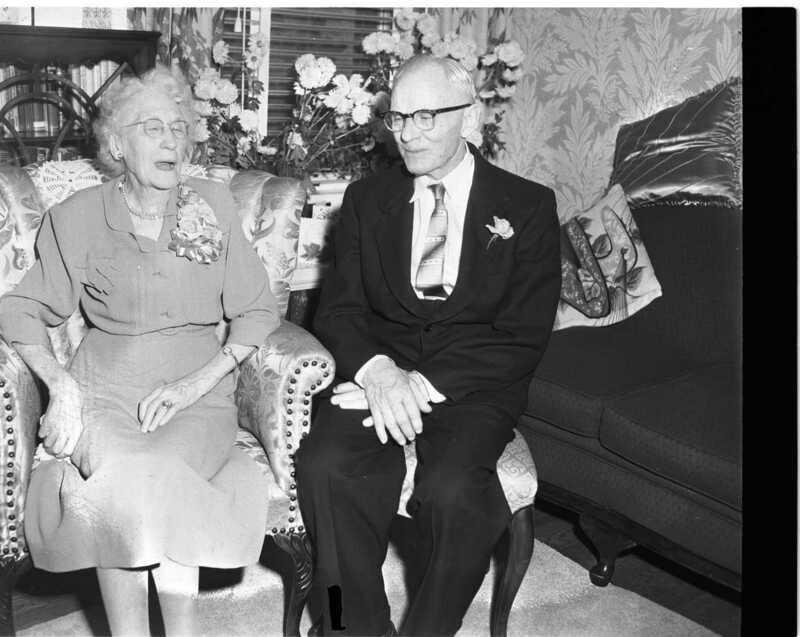 They were Mr. and Mrs. Roy French, and the roomful of flowers in their home at 322 King Street was ample evidence of the esteem which this couple has earned over the years. In fact, all but a few months of their 50 years of wedded life has been spent in Midland. Born at Waverley Nov. 28, 1880, Roy French went to school there and worked on his late father’s farm until 1900. 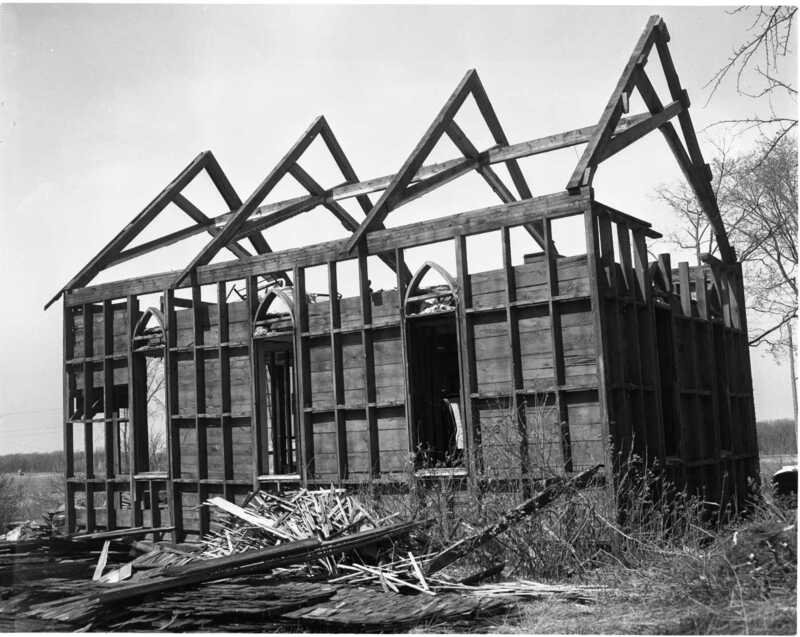 Then he decided to become a carpenter and spent two years learning the rudiments of this trade under the late Joseph Davenport. The “going” wage for young would-be-carpenters in the early days of the century was 12 cents per hour, for a 10-hour day. Realising his early education had been of a limited nature, the young apprentice attended the night school then in operation at the Midland YMCA. For three years, from 1902 to 1904 he studied drawing and mathematics, both of which were a big help in his later career. From carpentry, Mr. French went to Midland Engine Works, where he learned the rudiments of pattern making. In 1905 he joined the many young men who were taking Horace Greeley’s advice by heading west. He obtained a job in the Brandon Machine Works. About this time a young lady also decided to see what the west had to offer. She was Agnes Barbara McNeill, a native of Hullett Township, in northern Huron County. Eventually, Agnes and Roy met in Brandon and in the spring of 1907 were married. Back in Midland after his three years in the west, Mr. French found employment in the foundry department of the Canada Iron Corporation, where he remained until 1913, at which time the smelter shut down. Then followed a brief period with the Benson and Bray firm. But with the outbreak of World War I, Mr. French found himself back with his old employers Midland Engine Works. They were making 6-inch shells at the works and Mr. French started off as an inspector. Later he became the night foreman and eventually general foreman of the No. 1 plant. After the war, Mr. French moved around the bay to Sunnyside, to the Great Lakes Foundry and Machine Shop, operated by W. W. Nicholson. He remained with Mr. Nicholson until the latter’s death in 1937. In the spring of 1938, Mr. French took over the Nicholson business, which has carried on ever since under the name of Great Lakes Boat and Machine Co. Up until five years ago, Mr. and Mrs. French lived at 17 Ottawa Street. They have resided at 322 King Street since that time. 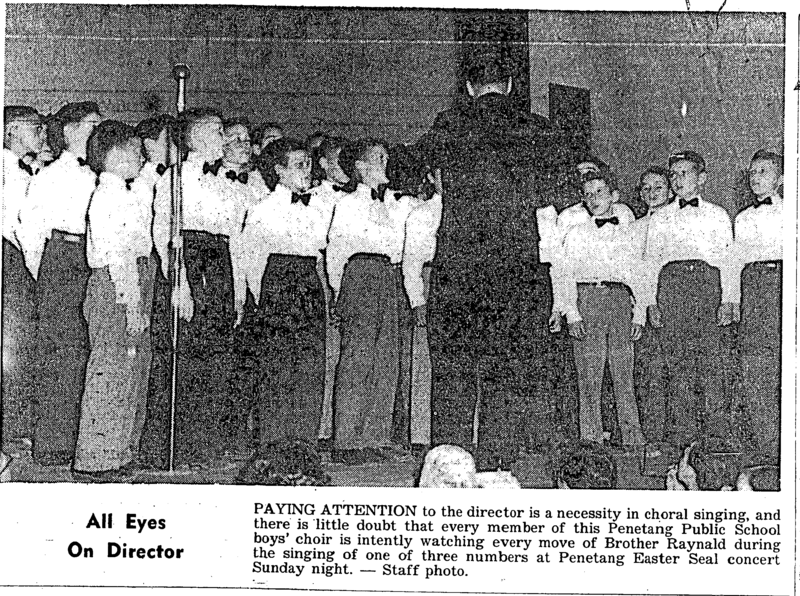 Mr. French is perhaps best known in Midland through his connection with Calvary Baptist Church. A member of the church since 1903, he has subsequently served on the board of deacons for more than 40 years, and for more than a quarter century was the superintendent of the Sunday School. Mr. French’s long service to Calvary was fittingly marked a year or so ago when the new addition to the church was officially opened. Although he served for two years as an alderman during the hard times of the early 30’s, Mr. French has never taken too keen an interest in party politics. “I have been guilty of voting for either party upon occasion,” Mr. French admitted. He admitted, too, that he was very fond of sport In his younger days, particularly baseball. He played on a number of teams back in the days when Town Park was a busy place all through the summer, with numerous “town league” clubs In action. Mr. and Mrs. French have one son, Alden, manager of Great Lakes Boat and Machine Co. Ltd. and two daughters, Mrs. J. E. Ayers (Florence), of Windsor, and Helen, a graduate of St. Andrews Hospital who takes and active part in the family business. There are also one granddaughter and six grandsons. 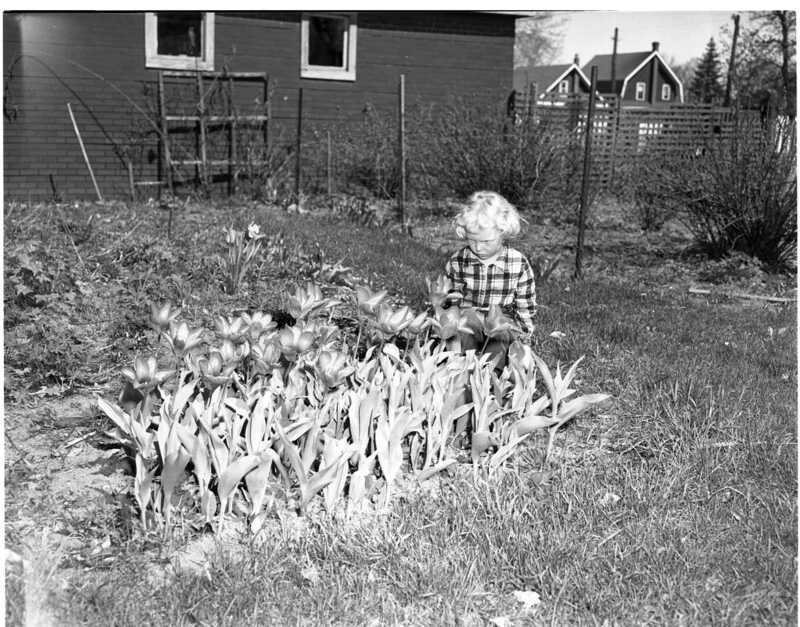 Admiring a bed of bright red tulips on the lawn of Mrs. A. Irish, 335 Manley Street is Patsy Beatty, 4 year-old daughter of Mr. & Mrs. Ken Beatty. School, church, home, during a century of existence this old building in Waubaushene finally fell to the wrecker’s hammer early this week. After several years use as a school it was the place of worship for Waubaushene Protestants until the Dodge Lumber Company built the nearby Memorial Church in 1881. Open house at Port McNicoll Public School. Little Kent Biggar, 8, has his work inspected by his dad Ted Biggar who is chairman of the school board in Port. Mom and sister Debra, 5, look on. Something extra at the Port McNicoll Public School open house was a display of oil paintings by 11 year old student Bobby Duncan. Last winter he took his first lessons in oil from Duncan Armbrest of Midland. 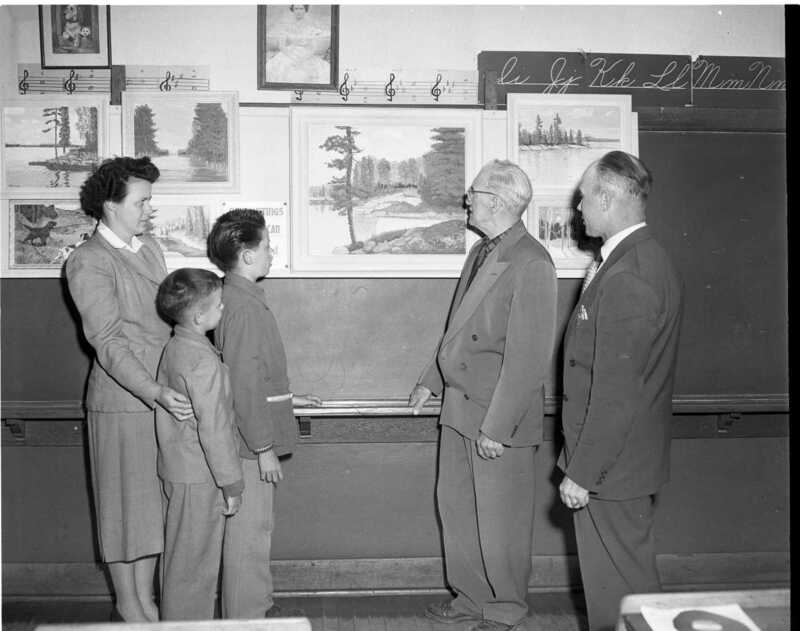 Pictured are Mrs. Duncan, Douglas 8, Bobby, Mr. Armbrest and father Bruce Duncan. Free Press headline Wednesday, May 1, 1957, “Rifle-Toting Youths Wound Dogs Shoot Glass Out Of Window Panes”. A letter read to council by Clerk W. H. Hewson, Mrs. F. L. Chilcott, Dufferin Street, complained of missiles striking her home and that her pet dog had died of wounds. Mrs. Chilcott said windows in her home had been broken by bullets, and slugs had lodged in the outside walls. Pete Lepage present at the meeting, voiced his complaint stating that he knew of three or four dogs that had been wounded presumably from .22 calibre bullets. Mr. Lepage further stated it had been necessary several times for he and his men to quit work at his marine railway on the west side of Penetang Bay because bullets were whistling around their heads. “I know that youngsters are firing rifles from around Beck’s yard, and they’re firing out over the bay. I understand high-powered .22’s have a range of at least a mile. It’s only one-half mile across the bay to my property, and those bullets have too much power left there to be fooling around with them,” Mr. Lepage said. County Herald headline Friday May 3, 1957, “High School Board Pares Budget Holds Rate Increase to .98 Mills”. In what has been termed a “cut-to-the-bone” budget, Midland – Penetanguishene District High School Board this year is asking the six municipalities it serves to raise $164,595.31 on a 9.97 mill rate based on a total equalized assessment of $16,526,654. 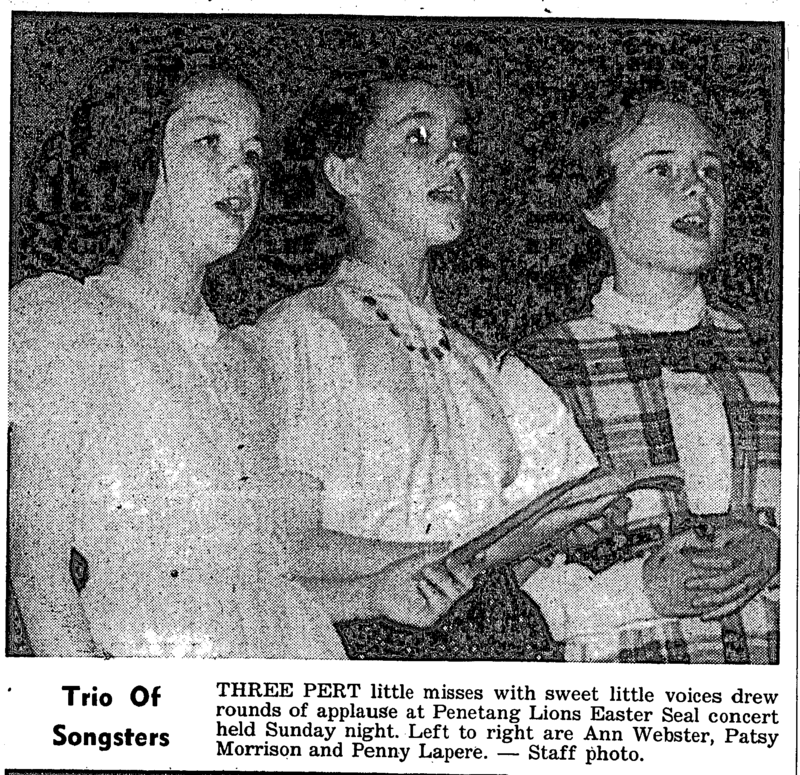 The 1957 high school levy is .98 mills higher than the 1956 rate of 8.99 mills for a net budget of $144,701.34. Midland taxpayers’ share of the 1957 budget will be 50.25 per cent or $82,709.17. On the basis of $7,000 per mill, the Midland tax rate for high school purposes will be approximately 12 mills. R. J. Pinchin was re-elected president of the board of directors of St. Andrew’s Hospital, at the inaugural meeting of elected board members in Midland YMCA April 26. Other board officers for the ensuing year are John D. Doughty, vice-president; Miss E. Violet Edwards, treasurer; A. E. Davidson, secretary. Standing committees are as follows: management, J. D. Doughty, chairman. Miss E. V. Edwards; finance, Gordon Moss, chairman, Frank Spence; public relations, Mrs. W. L. Attridge, chairman, R. A. Megaw; property John Burke, chairman, S. F. Malin. Penetang’s Town Planning Board became a reality Monday night with the approval of a bylaw appointing six men to the board. On the board are: Deputy reeve Archie Verrière and Chas. Thompson, one year; Art McKee and O. Ross, two years; C. S. Wice and George Bryant, three years. TOWN OF PENETANGUISHENE NOTICE re Dogs TAKE NOTICE that Mr. Earl Vivian has been appointed as Dog License Issuer for 1957. Time for purchase of licenses has been extended to May 15th, 1957, after which date all persons not obtaining licenses may be prosecuted. Mr. Vivian will attend at Council Chambers on Tuesday and Friday until May 15th, from 7 p.m. to 9 p.m. to issue licenses, TAKE NOTICE further that dogs are prohibited from running at large during months of May, June, July, August- and September, and provisions of By-law No. 1202 will be strictly enforced. By Order, Town Council, W. H. HEWSON, Clerk-Treasurer. Don Argue, who for the past 12 years served in the parts department at Boyd’s Service station, Midland, has now joined the sales staff of Bourgeois Motors Limited. Don, who was born in Midland and educated in the town’s public and high schools, is emulating somewhat the footsteps of Lionel Bourgeois, head of Bourgeois Motors. Mr. Bourgeois formerly worked at Boyd’s. Mr. 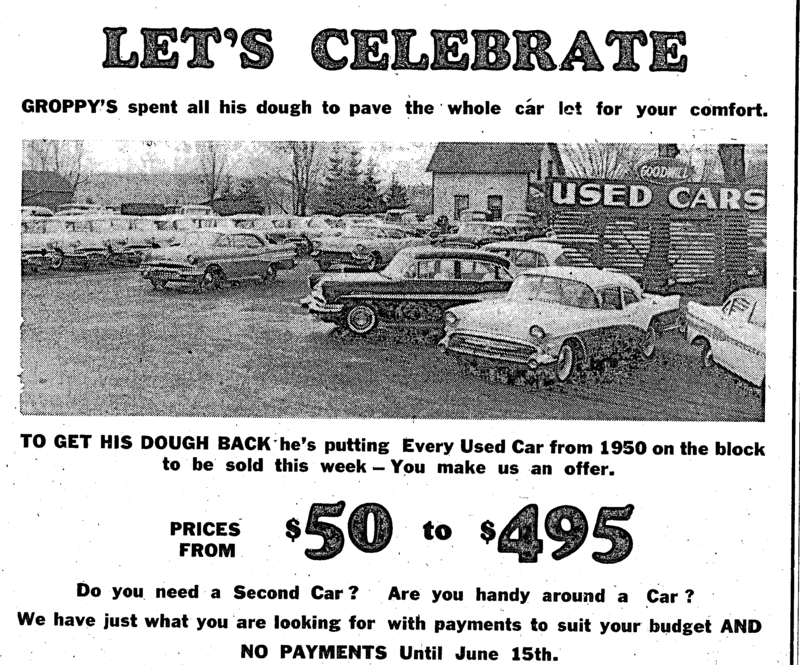 Argue, who has been in the garage business for the past 16 years, started with Boyd’s when they operated a service station on Hugel Ave., transferred to the Shell Oil Co. at Barrie for a year and then returned to Midland. He rejoined Boyd’s staff at the King and Yonge Streets gas station and remained there until transferring to Bourgeois last week. Construction work on six modern cottages is under way in Little Lake Park, Midland. Floor of one had been completed yesterday. New cottages, total cost of which will be in the neighborhood of $12,000, are to be erected in the extreme westerly section of the park, near three cottages which were built last year. They are to be completed early in June. Contract for the buildings was awarded to Nap Beauchamp Construction of Penetang ($9,300). Electrical work is being done by Walker’s Electric ($580), and plumbing by Norman Reynolds ($2,773). Seriously hurt in an automobile accident last week, the condition of Joseph Leeking, well known in Midland, has shown some improvement recently, according to his physician, Dr. James Small. Mr. Leeking suffered severe chest injuries and a broken hip when the car he was driving was struck by another vehicle on Vindin Street, near the northwest boundary of Midland. Mr. Leeking has been a patient in St. Andrews Hospital since the crash. One hundred and thirty-two properties, 25 of them in North Simcoe municipalities, will be sold by public auction at a treasurer’s sale of lands in Barrie July 9. The lands are being sold to discharge tax arrears against them. In quantity. Port McNicoll heads the list with 16 lots and parts of lots to be placed on the auction block. One of the lots has, in tax arrears and accrued costs, $148.82 against it. TEN YEARS AGO THIS WEEK: Finance Minister Douglas Abbott announced that, effective July 1, income taxes for those in the lower income brackets would be halved. Average cut in personal income taxes was 29 per cent. * ** Forty-five persons representing churches in Midland and district attended a recreation leadership course at Midland High School. *** Gordon Boyd, Doug Haig, Win Smith and Jack Doughty had organized trout fishing parties. The groups planned to do their angling in the Huntsville and Algonquin Park areas. * * * A memorial window, honoring two pioneer Penetang doctors, was unveiled in All Saints Church, Penetang. Doctors honored were Dr. George Bowman and Dr. F. H. Spohn. * * * George S. Dudley, Q.C, Midland, had been appointed secretary-manager of the Canadian Amateur Hockey Association. 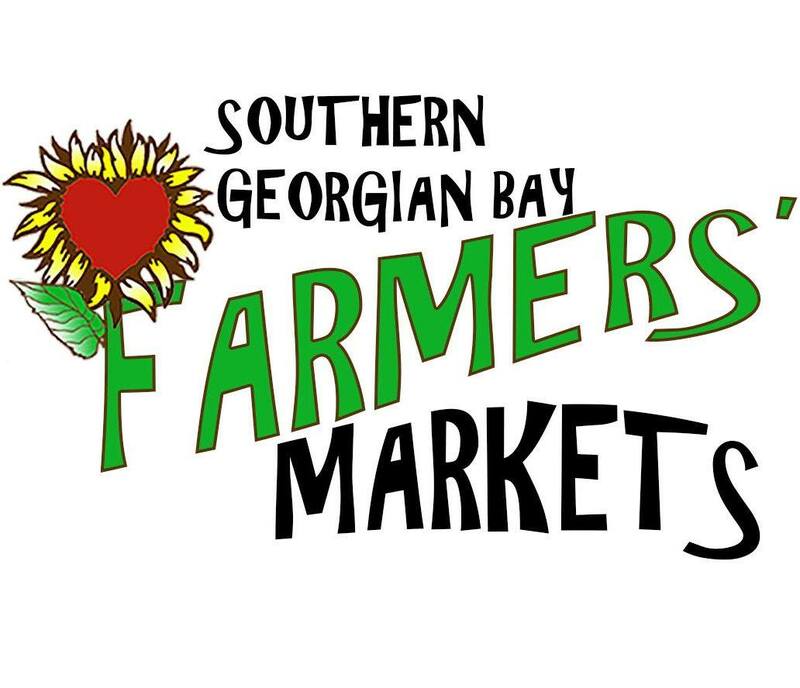 * * * Coldwater businessmen were making plans to organize a Board of Trade in the village. A committee had been named to interview village merchants and obtain their views on the proposal. Margaret Rose Taylor of Waubaushene become the only girl in a class of 49 male engineering students at McMaster University in Hamilton. Daughter of Mr. and Mrs. M. F. Taylor, her interests ran to maths and science when she attended Midland District High School. But she didn’t want to become a teacher of those subjects, and eventually settled on engineering. A resident of Midland for the past 52 years John Sharp died April 29 at St. Andrews Hospital. John Sharp was born at Muir Kirk Scotland, April 20, 1879, and was educated there. He came to Canada when he was 24 years of age and came to Midland in 1905 and worked at the flour mill and then at the shipyard until it closed down a few years ago. In December, 1909, he married Sarah Jane Gilbank in Midland where he had resided for the past 48 years. A member of the Gospel Hall, Mr. Sharp liked to read, until his eyesight began to fail a few years ago. Predeceased by his wife, Feb, 1, 1955, he is survived by four children. Nelson of Burlington, Mrs. Leahan (Annie) of Long Branch, Stella at home and Bert of Midland. Also surviving are two sisters, one living in Montreal and the other in London. H. J. Thompson and Sons, Midland, this week acquired one new staff member and promoted another. 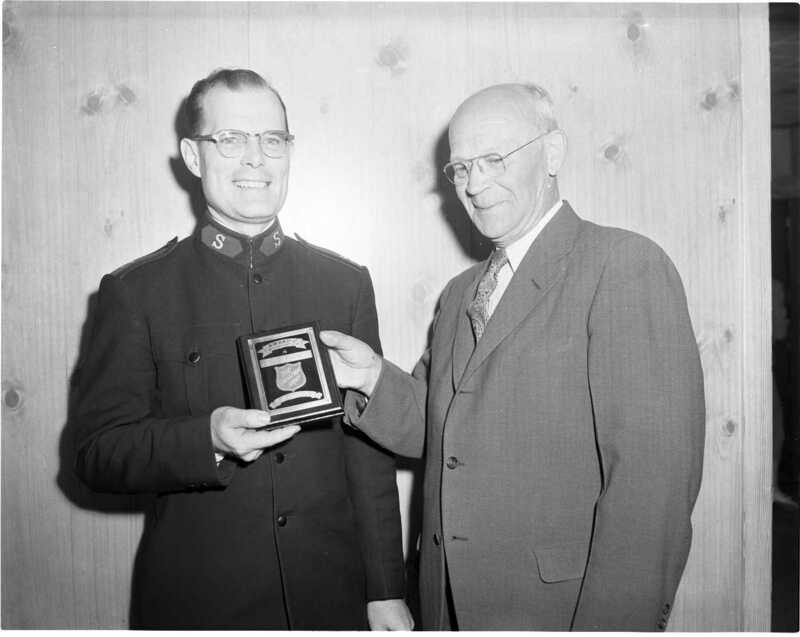 Promoted was James Downer who started with the firm in the fall of 1945, following his discharge from the RCAF. He has been named shop foreman. 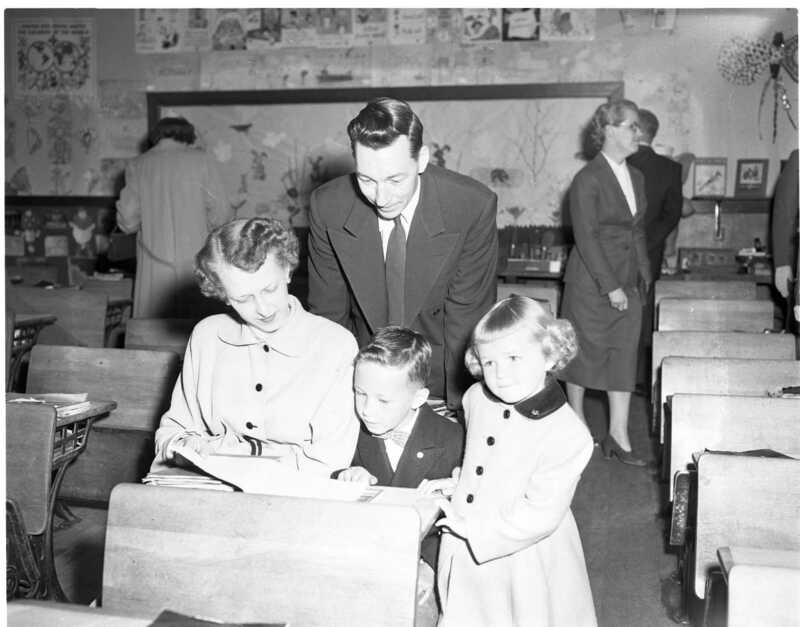 Son of Mr. and Mrs. Arthur Downer, Jim was born in Tiny Township, receiving his education there and at Midland High School. Following his graduation Jim spent five years sailing on Great Lakes ships, joining the RCAF in 1941. The 41-year-old foreman completed a tour of operations overseas with 424 RCAF Bomber Squadron, serving as an observer. Following his tour, he served a year and a half as an instructor and returned to Canada in August, 1945. Commissioned in 1943, he was a flying officer when he was discharged. He started with H. J. Thompson and Sons in September, 1945, as a plumber’s apprentice. Married to the former Evelyn Denis of Midland, they have two children, Noreen, 14, and James, 4. Jim is a past president of Midland branch, Canadian Legion, a member of the YMCA Foreman’s Club and an officer in the Grey and Simcoe Foresters reserve army unit. Joining Thompson’s sales staff is 28-year-old Ernie Booth, a native of Toronto where he attended public and high schools. Previous to joining Thompson’s staff, he had managed an appliance store in Midland. He is married to the former Joan Parker of Tay Township. They have three children. After graduation from high school, Ernie served in the Royal Canadian Navy Reserve for three years. He was stationed in Bermuda, Toronto and Halifax from 1948 to 1951. He is a member of the Canadian Legion. Mr. and Mrs. Henry Mosley of Midland announce the engagement of their daughter, Beverly Anne, to Mr. Boyd Watson Leonard of Wyebridge, the marriage to take place on Saturday, May 25, 1957, at Knox Presbyterian Church, Midland. Mr. and Mrs. John Cameron, Midland, wish to announce the birth of their son, David Lawrence, on Wednesday, April 24, 1957, at St. Andrews Hospital, a brother for Douglas.